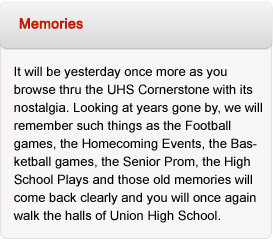 Congratulations to the Alumni of Union High School on the launch of your new website! It may seem strange to see something written by someone from another school but this is a letter of encouragement. For the past 10 years I have been maintaining the website of Alderson High School and I’ve been amazed on how it has evolved. I wouldn’t have missed this adventure for anything. With your new website you now have another venue to connect with old friends and keep up on what is going on in Union, and the surrounding area. Some of you will fire up that old desire to write again, and others will learn that they have that ability. But this is only if you participate in what the Class of 1961 is trying to do. Remember, the Class of 1961 can not write all the wonderful stories, collect and send the treasured photographs and print your history. They will depend on your participation for your site to grow to what it can be, a part of you. In doing her research on the site, Linda Cohernour contacted me last fall and I learned of some of the issues your site was experiencing. But now it’s up and running and I encourage you to get involved in the adventure. Help shape its development. This is one thing that really is, “all about you”. Once again, don’t be a spectator, be a participator!